So we’ve baked our very own anti-spam WordPress plugin to solve a problem that has been plaguing us for the last 6 months. 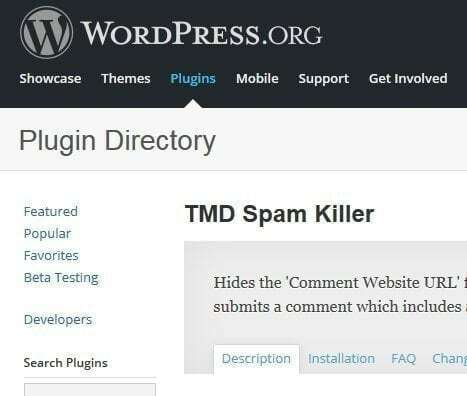 Despite one of our blogs having two anti-spam plugins plus Google Captcha, we were spending a good hour each week weeding out the ‘real comments’ that had fallen into the WordPress Spam Inbox. Our initial plan of action was to throw some money at one of the coding outsourcing portals, but when quotes started coming back at $100 for a few lines of code, well, that was just stupid. I had a spare hour or two this evening, time that I would quickly save over the coming months. Website spam robots have two aims, firstly they populate spam links within the main body of a spam comment, and the spam robot also includes the spam destination in the Comment Author URL of the comment field. Removes the ‘Comment Author URL’ field from the WordPress comments form; for most non-technical blogs this optional field is irrelevant. Kills WP (hey that saves some CPU cycles) if a comment is submitted which contains a Comment Author URL. We don’t need to stand for this any longer; say goodbye to Comment Author URL Spam and save CPU cycles!